It’s on the move in the legislatures of Utah, North Dakota, Minnesota, Iowa, Indiana, Michigan, Pennsylvania, Virginia, North Carolina, Georgia, Alabama and Texas! Gun control politicians, like Hillary Clinton, ‘bet the farm’ when they campaigned against the 2nd Amendment, across the country, and thought they could get away with it. 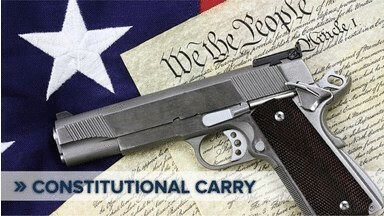 We’ll be bringing forth our Constitutional Carry legislation shortly, and we’re going to need YOUR help to make it happen. When the time comes, we’ll need gun owners from across Wisconsin to contact their state representatives and senators to co-sponsor this excellent legislation!